Pavan is a 6-year-old with Acute Lymphoblastic Leukaemia (ALL). Even with chemotherapy, his leukaemia has not come under control. The doctor has advised a bone-marrow transplant to save Pavan's life. His father, a lab technician is the family's sole breadwinner and he needs financial help saving his son's life. Pavan is Chandrashekhar and Shanti's only child. He loved going to school and every day, he would come back with stories of what happened at school. Ever since his cousin Bhuvan started school, it is all Pavan also wanted to do. Pawan started school full of expectations that were more than met. Last November, Pavan came back from school with a fever. By next day, he had developed a swelling in his face and his parents took him to the doctor. The doctor ran tests and diagnosed Pavan with blood cancer. They explained to his parents that Pavan's body was producing cancerous blood cells that were affecting the production of normal blood cells. 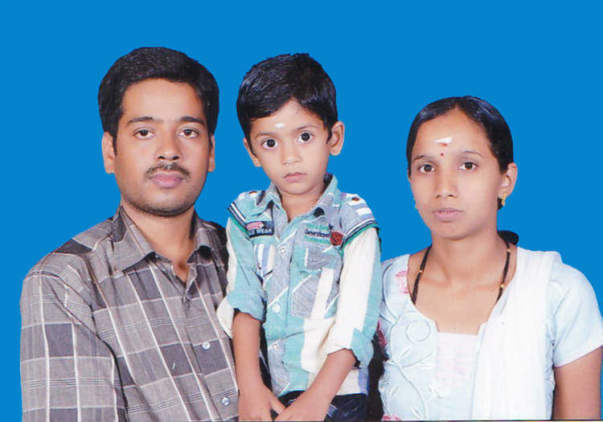 Pavan is in Narayana Hrudayalaya, Bangalore to prepare for a bone-marrow transplant. At present, he is taking strong chemotherapy so he the transplant can be effective. His parents have been asked to arrange for Rs 30 lakhs. An amount that is impossible for Chandrashekhar – a lab assistant to arrange. 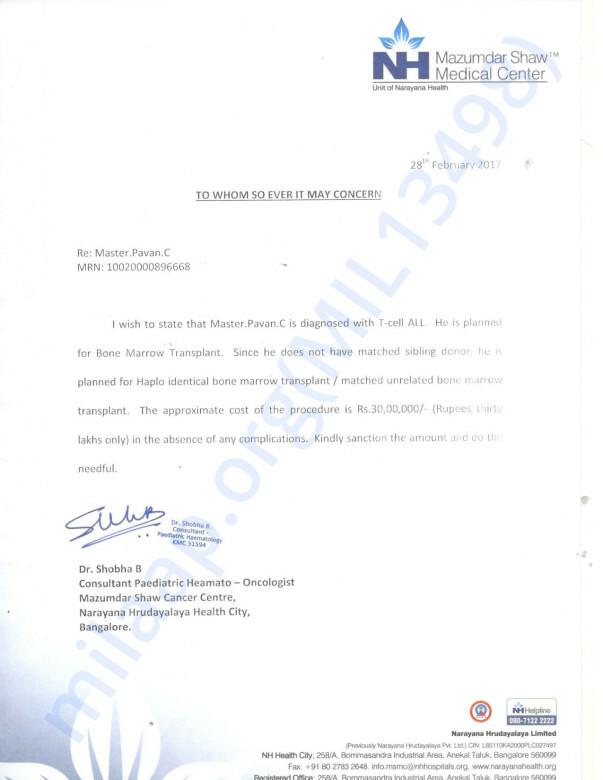 They have already spent Rs 6 lakhs on his treatment and have no means left to save their precious child. Contribute now and help these parents save their only child. Pavan underwent the transplant and is doing well now and we're all extremely thrilled to see him recovering. He is stable now and is undergoing treatment successfully. We've advised him to come for a visit to the hospital once a month, so we can observe his progress. Thank you everyone, once again! We have some good news to share with you. Pavan is doing good now. He visits the hospital once in a while for regular checkups. His response to the treatment has been good so far. Thank you for all the wonderful support you have shown Pavan. Here is an update on Pavan's health. He has undergone the treatment and received his mother's stem cells 20 days back. Now he is stable and is receiving medications to prevent graft reaction and infection. Thank you for coming forward to help him. Please pray for his recovery. I pray and hope this child to get well.